This is the 9th in a series of articles highlighting tourism spots in Seoul. The useful guide for planning weekend trips in the capital city will help readers rediscover Seoul. - Ed. "Dae Jang Geum" ("Jewel in the Palace"), a Korean TV series which explores the life of a Joseon Dynasty chef turned doctor, was first broadcast in 2003 and has since aired in some 60 countries, spawning an interest in Korean culture and food. Although Janggeum, the show's protagonist, is a historical character, there are restaurants in Seoul where modern people can glimpse what Janggeum might have made for the royal family and trace her passion for cooking. Janggeum was a real person, mentioned in Joseon Dynasty annals who lived in Korea some 500 years ago. As a royal medic during the reign of King Jungjong (1506-1544), she was said to be an excellent chef. However, little is known about her personal life. As a historical recreation in the drama Janggeum is kicked out of the palace while working as a chef but later comes back as the king's personal doctor. According to Joseon Dynasty annals, the real Janggeum worked in the royal kitchen in front of the Jagyeonggeon of Gyeongbokgung. The kitchen no longer exists, but Janggeum is said to have prepared meals there for the king and the queen. Janggeum's dishes have been handed down from generation to generation as "royal court cuisine". As royal meals were prepared with the best ingredients from across Korea, they represented the finest and rarest food and were characterized by elaborate presentation. Some of Korea's best chefs, who could be dubbed Janggeum's successors, include Han Bok-ryeo and Jeong Gil-ja, who are designated "important national cultural treasure No. 38". They served as food advisors to "Dae Jang Geum" and their students stood in for Lee Young-ae, who played Janggeum, preparing for royal meals. Both run culinary schools specializing in royal court food: Han's Institute of Korean Royal Cuisine (02-3673-1122) in Wonseo-dong Jongno-gu and Jeong's Institute of Royal Korean Dessert (02-3673-4344) in Gahoi-dong Jongno-gu, respectively. The two institutes provide many programs on royal court cooking, including a customized program for foreign visitors. Those who wish to participate in the royal court food cooking experience should book in advance. Today this type of cuisine is collectively known as hanjeongsik - Korean haute cuisine - rather than royal court food. Influenced by traditional food served at the royal palace and royal banquets, hanjeongsik in the past referred to a meal of rice and soup with numerous side dishes. It was usually enjoyed with music and dance. Most hanjeongsik restaurants in Korea now serve four- to five-course meals so that customers can relish the dishes one at a time. In the drama, after being expelled from the palace, Janggeum learns medicine and returns as a royal doctor. Females with a medical background were indispensable for palace women, including queens and princesses. Despite tradition, Janggeum is appointed the king's personal physician. It is speculated that as a medical practitioner, Janggeum worked in a public welfare and medical service institute for the poor and sick called "Bojewon". This was located around Jegi-dong, Yongdu-dong and Dongdaemun-gu - the site of the present-day medicinal herb market Seoul Yangnyeongsi. 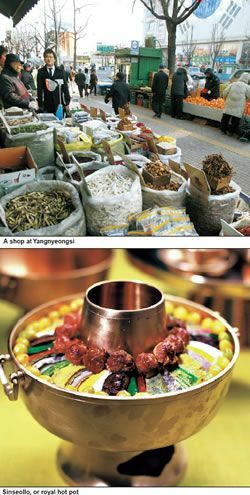 Created in the 1960's, Seoul Yangnyeongsi is Korea's largest medicinal herb market. It is here that more than 70 percent of Korean medicinal herbs are circulated and more than 1,000 herb shops, herb processing companies, and herb clinics are clustered. Janggeum might have loved the market because she would have been able to get herbs from all over the world. The building across the street is the Oriental Medicine Museum (02-3293-4900). Created by the Dongdaemun-gu Office and managed by Seoul Yangnyeongsi Association, it displays a variety of paintings, books on medicinal herbs, tools used to prepare them and some 350 medicinal herbs. It also houses a room where visitors can find their body types based on the ancient theory of Sasang Medicine. In addition, the museum has a souvenir shop and a learning center where visitors can experience medicinal herb soap, tea and aroma bag-making. Knowing traditional Korean medicine helps better understand the culture. Koreans tend to take tonic medicine to stay healthy even if they are not sick. There are many examples. Koreans call mountain spring water "medicinal water" regardless of its medical effects. Seasoned sweet rice with chestnut and jujube is called "medicinal rice", while spices are often called "medicinal seasoning". Janggeum's mastery of cooking and medicine is believed to have been based on such a background. Tteok (rice cake), also spelled ddeok, is an essential part of Korean cuisine and has been indispensable for major occasions and holidays. One of the best areas to taste and learn about ddeok is around the Jilsiru Tkeok Cafe and the Tteok Museum, located some 100 meters away from the main gate of Changdeokgung. Many foreign tourists visit this area to taste ddeok and traditional Korean tea and learn about ddeok at the museum. Jilsiru refers to an unglazed earthenware ddeok steamer made of clay. Jilsiru Tteok Cafe serves a variety of ddeok and traditional Korean teas and sells ddeok cake for various occasions. The Tteok Museum is on the second and the third floors of the cafe. The museum displays various kinds of ddeok made for traditional holidays. It also offers an opportunity to prepare ddeok in groups of 20 or more for 10,000 won per person. [ChanMi's drama news] Jo Yeo-jung in a new drama, "The Road Home"